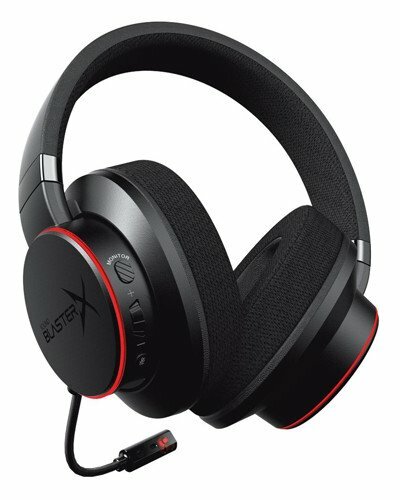 Creative's uprated drivers make the Sound BlasterX H6 a great value gaming headset. There isn't a shortage of headsets for gamers these days with numerous vendors offering value-driven solutions that not only allow you to communicate with friends over Discord and other VoIP software, but also sounds good for enjoying some media. Creative has refreshed its line-up of headsets with 50mm Neodymium drivers and the Sound BlasterX H6 is a more affordable option for those who don't wish to spend a little more on the BlasterX H7. In short: the H6 is worth every penny and should be on your shortlist. Bottom line: Creative strikes a solid balance between affordability and functionality. A good pair of headphones is important for not only music and film, but also gaming too. Creative launched the H6 with 50mm Neodymium drivers — commonly found on headphones and gaming headsets at this price — with full 7.1 virtual surround sound support, and a whole host of additional features. Creative Sound BlasterX H6 has absolutely everything you need to game well on a budget. The company had all consoles in mind, not just PC. This makes it possible to purchase the H6 and enjoy using it with PC, Xbox One, PlayStation 4 and even the Nintendo Switch. The choice of a 3.5mm jack or USB makes this all work seamlessly. Usually, with gaming headsets, you'll find the microphone can retract into one of the cups, which keeps it out of the way but means you still have a protruding microphone when you're out and about using the headset for media. Creative lets you remove the microphone altogether to get around this, but it does mean it won't retract into the headset itself. The microphone itself is very good thanks to noise-reducing ClearComms technology, and the hardware EQ profiles mean you can enjoy a few different modes without using Creative's software. If all that wasn't enough, the earpads are breathable to not make you feel fatigued or sore after long gaming sessions. Lastly, we have customizable Aurora Reactive RGB lighting. I'm not a big fan of lighting on headsets since you don't really see it, which makes it a little pointless. Actually using the H6 is a whole different story and you quickly forget about the lighting. The headset is comfortable — not quite as comfy as SteelSeries' headbands, which are the best in my opinion — and the sound quality is solid. Then there's the microphone, which sounds just as good to everyone else in discord. For the price, the 50mm Neodymium drivers work well with Creative electronics to produce some killer soundwaves. Creative does a horrible job with its software support as it can prove a little difficult to find exactly what you're looking for. The Sound Blaster Connect suite is what you use for all its premium gear, but even trying to download the most recent version requires you to choose a recently released Creative product that uses the suite. Luckily, you don't need to find the latest version since the software can handle updates itself, but it's just a pain that could be remedied by adding a massive download software link on the respective product pages. And the software itself is much better than before, but could still do with a little more work — it just seems a little lacking somehow. Also, the lighting. I understand companies continue to believe that all gamers need to have a rave whilst gazing at a screen, but it just seems a bit pointless in a headset. Not only can you not see the lighting, but it borders on obnoxious. Thankfully, it's subtle and you can largely ignore it for the most part, but it's something I'd prefer companies leave out of headsets altogether. Should you buy the Creative Sound BlasterX H6? Creative's Sound BlasterX H6 should be on your shortlist if you happen to be looking for a new gaming headset. Not only is it well priced at around $80 at launch, but the headset comes packing all the top features you'd expect from a premium offering, including advanced drivers, RGB lighting, profile support, and more. There's a lot to love about the headset with only a few drawbacks like the software offering from Creative being a little lackluster — nothing that happens to be a deal breaker.